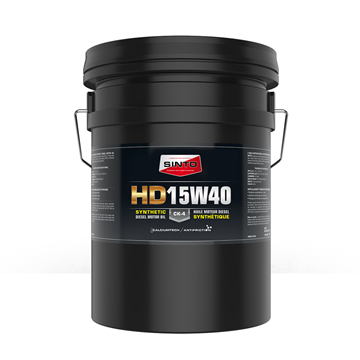 SINTO is proud to announce the launch of a new range of synthetic diesel HD motor oil available in grade 5W40 and 15W40! Faithful to our mission, SINTO’s synthetic HD diesel motor oil surpasses the most severe requirements of performance on the market. This high-end product is targeted for a vast industry of diesel engine users such as excavation, transport, mines, foresters and garages who wish to give maximum performance and protection to their engines. SINTO’s HD oil contains a top-quality basic synthetic oil and includes the CALCIUMTECH technologies along with SINTO’s ANTIFRICTION in order to assure maximum engine performance. During the launch of this product, SINTO’s management team was very proud of the accomplished work: “it is a big day in SINTO’s history, we have always been recognized for the quality of our antifriction products and we had many demands to offer motor oils already handled. The R&D team met the challenge and designed the best possible product by combining superior synthetic oil and SINTO’s additives!” Said the company’s management. The product is available as of now. We invite you to contact your local lubrication Expert to have more information or directly contact SINTO by e-mail at sinto@sinto.ca or by telephone 1-800-463-0025.